What Do The Kids Want to be for Halloween This Year? The conversations started around the dinner table a few weeks ago…. what did everyone want to be for Halloween? As usual, I tried to sway my kids towards doing a whole-cool-group-thing. I proposed ideas of dressing up as the characters from “Hotel Transylvania”…. but the girls both wanted to be Mavis and the boys all wanted to be Frankenstein. So then I thought it might be fun to all goes as the characters from “Wreck It Ralph”…. but again, I could not gain agreement. Everyone around here has their own opinion….. I have one daughter who wants to be a cheerleader, and one who settled on the idea of going as a black cat. My older boys demand that Grandpa wields his creative genius as he did last year and develop a costume out of a box. My oldest wants to be a slot machine that actually works and dispenses loot (candy I hope) to kids who pull the lever. Spencer thinks he wants to be a football player- which would go nicely with my daughter who is masquerading as a cheerleader. Another of my boys wants to go as a “Jack-O-Lantern”… and by that I do not refer to a jolly carved pumpkin. No, his name is Jack and he wants to dress up as a lantern that has a big “O” plastered on the front. Cute, right? And that brings us to our youngest son, Alex. Now Alex can pick from a myriad of costumes that we already own from years past… all available right now, in a box, in his size. He could be Captain America, Hulk, a skeleton, Luke Skywalker, Harry Potter, a race car driver. We've got it all… complete with accessories. And Spencer encouraged Alex to try all of these things on, and model them for the family, which Alex did accompanied by tons of giggles. But all the while, he insisted, “Mom, I really want to be a Ninja”. I tried to convince Alex to just pick one of the costumes we had….. (you know, being my frugal and practical self), right up until bedtime. When he tearfully said to me as I was kissing him good night…. “Mom- all I want to be is a Ninja.” My heart broke. Why should this little boy- who is delighted by the very idea of Halloween get stuck wearing a hand-me-down costume? It's not his fault or problem that we have box-full of other costumes….. let's get the boy what he wants! But here's the thing…. 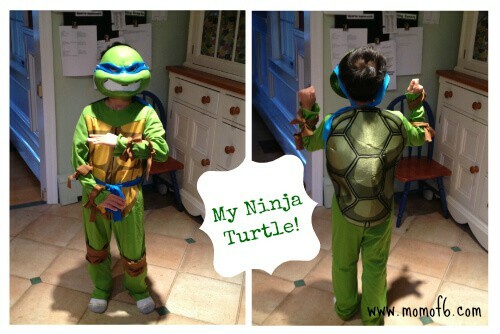 I am not even sure that Alex really even knows what a Ninja is…. Enter the Kmart Kreator! You can go online and pick out the components of a costume, and then upload your child's face right onto the screen so they can get a sense of what the costume might look like on them! Brilliant! 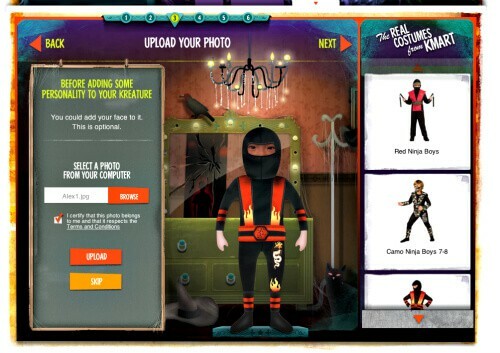 We selected a Ninja costume for Alex, and uploaded his photo to get started…. Then we picked out some accessories…. Which made Alex giggle…. but he said “No, MOM!”…. in that 6-year old exasperated kind of way…. So we moved on to selecting a cool background for his Ninja guy…. 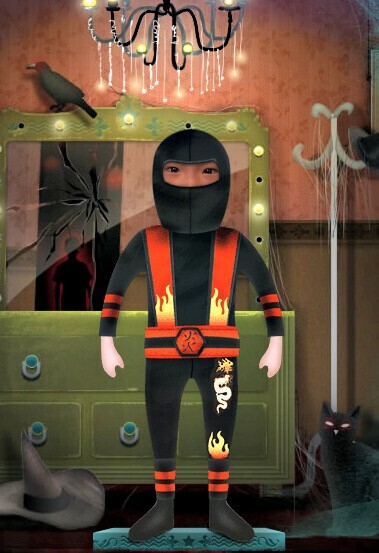 And voila… here is Alex as a Ninja! Except….. as it turns out- that's not what he meant. He wants to be a Ninja Turtle! And thankfully, Kmart Halloween had that costume too! Because ever since we received it…. Alex puts it on every single day after school. This costume has made him so happy. And it's made me happy too…. knowing that I did the right thing for my guy! 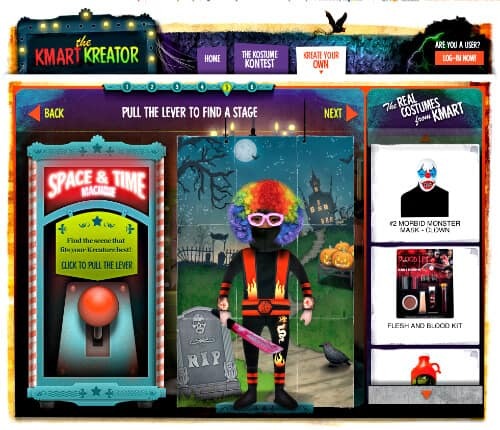 Using Kmart's Kreator is helping me create a fun and memorable Halloween for my family. Try it for yourself! 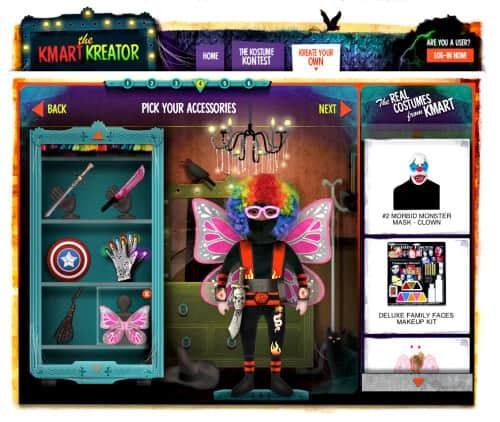 Find all your Halloween needs at Kmart's Halloween Shop. « Links to Love: Cool Stuff to do Right Now!